THE INSTRUCTOR RECOMMENDS USING THE AAPC CODING BOOKS FOR CLASSES. 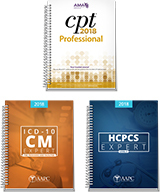 IMPORTANT: Students will be eligible to obtain CPT, ICD-10-CM, HCPCS and CPC Workbooks and Textbooks from AAPC at a discounted rate after enrollment forms have been completed and submitted to Career Coders. How to obtain the discounted rate will be emailed directly to the student. 2019 AMA CPT Professional: Use the official American Medical Association code book with codes, descriptions, and their guidelines for use. 2019 HCPCS Level II Expert: Find Medicare's National Level II procedure codes for DME, drugs, and other medical supplies all in the HCPCS Level II Expert. 2019 ICD-10-CM Codebook: Get quick access to the latest version of the ICD-10-CM code set with intuitive color-coded symbols, alerts and illustrations. This diagnostic code set is used in physician offices and outpatient facilities. See information at top of page how to receive these books, AAPC membership and CPC exam at a discounted rate. Note: If you have the 8th Edition, you can use it. It is available HERE if you would rather purchase it.